The Quarry Tour has been a core program at Halibut Point for nearly as long as the site has been a state park. The tour is an excellent opportunity to learn about the history of building with stone in America, a subject still in need of its defintive study. 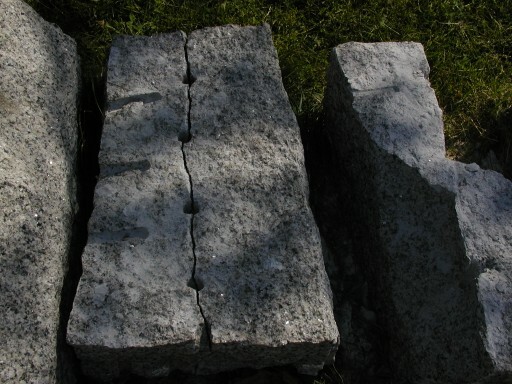 Today, one still needs to “cobble” together a history from a number of written sources and one of the best is Brabara Erkkila’s book, Hammers on Stone: The History of Cape Ann Granite. Long out of print, Erkkila’s book does an excellent job of relating much of the subject’s history, especially the founding role two Massachusetts cities – Quincy and Rockport – played in an industry that in many ways, even some surprising ones, helped define a young America. Early European settlers in North America seldom used stone for building. When they arrived on the continent they usually didn’t have to look far to find substantial old-growth timber sufficent for their construction needs. An equally significant reason why they didn’t build with stone was because they had no idea how to quarry and cut it. When settlers in early America did use stone, usually uncut boulders and surface rock, it was for structural foundations that was in most cases fitted together and bound by a horse-hair plaster, which is why many very old buildings still smell like a barn. The fieldstone walls you see in the woods today usually originate from a time later than most believe and can be generally clumped into two categories: The less often seen fieldstone walls constructed from pebbly or fist-sized rocks indicates a previous farm area and came from planters picking up and tossing aside rocks that the winter freeze brought to the surface prior to the initial spring plough while the fieldstone walls constructed of larger boulders indicates pasture and the walls served as livestock pens. These walls are almost always four-feet to four and one-half feet tall and for the most part were built from 1800 – 1820. But elaborating on the subject and timeline of fieldstone walls is for some other time … suffice to sat it’s relatively rare to encounter pre-19th Century stone structures, particularily residences, in America. On the north shore of Massachusetts two significant examples of pre-Revolution stone structures are the Choate Bridge in Ipswich (1774), said to be the oldest stone arch bridge in the United States, and the Babson Cooperage (1658) on Rt. 127 in Gloucester. The Choate Bridge, spanning the Ipswich River, is of no architectural design and comprised mainly of fieldstones. The Babson Cooperage, built as the workshop of a barrel-maker and today a museum, is made of fitted stone. The most noteworthy stone building in pre-Revolution America is without a doubt King’s Chapel in Boston. Constructed of Quincy granite beginning in 1749, the church took five years to complete, mainly due to the challenges of quarrying and cutting the granite. Until about 1800 the main methods of stone-cutting was to set a fire on top of a rock to heat it up and expand the mineral’s molecules, and then drop an iron ball from some distance above it. The other way they attempted to split stone was to set some gunpowder under a slab and ignite it. Needless to say, neither method was an efficent way to fashion good building stone. The golden era of stonebuilding in America was ushered in approximately two decades after the American Revolution, initiated by two factors: the desire to create a young country’s first grand monument and the message, the semiotics, (study of sign-systems by which meaningful communication occurs) of stone imagery. Notice the buildings around you today that are constructed of stone (not brick, which is a manufactured stone material, but natural stone) and you’ll see that many natural stone buildings are banks, municipal structures and jails, most of them dating to pre-1900. Banks and financial institutions constructed of natural stone like granite send the semiotic message that your money is safe from those whom might want to steal it and that the business won’t fold, that it’s here to stay. “Granite Savings Bank” – that’s where you want to put your money, isn’t it? Another message imparted from creating structures like municipal buildings with natural stone was that though America was a young country, it was here to stay. Constructing jails from natural stone, well, the message in that image is pretty clear, that the populace needn’t worry about the convicts breaking out. “Security,” “permanence,” “strength,” – those are words that one tends to, at least subconsciously, associate with structures built of natural stone. And when it became time for America to build it’s first national monument, one to commemorate its fight for Independence, it had to be from the most noteworthy ceremonial building material known – natural stone. And it was the connection between the building of a jail and a monument that began America’s first great domestic industry. In 1803, Governor Robbins of Massachusetts desired to construct a jail from granite in Charlestown. Around that time, a talented young architect and builder named Solomon Willard moved from the western part of the state to Boston. The two met, discovered a mutual enthusiasm for the endeavor and set out to identify an appropriate load of granite for the project. Walking, yes walking hundreds of miles across the state, they found two suitable sites, one in Quincy, a few miles south of Charlestown and another on Cape Ann nearly forty miles away. They chose the Quincy site due to its proximity, but one big problem loomed – how were they going to cut and transport such an enormous amount of stone? Passing through Salem one day, Governor Robbins noticed the foundations of many buildings, some fashioned from very large cut blocks of stone, exhibiting unique tool markings every six inches or so. He inquired to one landlord and was put in touch with a contractor from Danvers who did the work. The gentleman demonstrated to the governor his method of hand-drilling holes few inches apart in a straight row before inserting metal components called “wedges” and “half-rounds.” Once they were set into the stone, the contractor tapped on them with a twelve-pound hammer and eventually the rock would break evenly along the drilled line. Governor Robbins hired the man and sent him to Quincy to teach officials of the nascent jail quarrying project this stone-breaking method and it’s said that Quincy was the first “experiment” in splitting stone using widgets and half-rounds. Until recent years a number of historians credited workers in Quincy as the first to cut stone that way, but the latest and most detailed research, mainly by Barbara Erkkila and a few others has uncovered the Robbins-Willard-Salem connection. In Hammers on Stone, Erkkila maintains that there’s a connection between the contractor Governor Robbins met in Salem and Cape Ann. Subsequent research has revealed an earlier version of stone-cutting via widgets and half-rounds on Cape Ann since at least 1766. Today on Cape Ann one can see numerous examples of pre-19th Century stone-cutting, usually along specific shorelines where mooring stones were cut. They exist from the adjacent north of Halibut Point at Folly Cove, along the Halibut shore and southwards along the Atlantic Path all the way to Back Beach in Rockport. You can find out more by attending our Quarry Tour or one of our geology programs that we feature at times during our programming season. Though there’s excellent evidence of stone-cutting by widgets and half-rounds on Cape Ann before 1800, it shouldn’t detract from the glory of the Quincy Quarries. The granite being cut there for the Charlestown jail came at a time when sentiment for a national monument reached a crescendo. Those two factors, along with the technological innovations at the Quincy Quarries such as invention of the “derrick” and pulley systems to hoist and move stone and the “two-gauge” railroad (rails two feet across) pulled by ox (an invention that paved the way for the steam locomotive) as well as Boston’s role in the Revolution and the fact that the jail was being built very close to where the most famous battle of the Revolutionary War occured, all coalesced into what became the project leading to the construction of the Bunker Hill Monument. The attention surrounding the building of America’s first national monument, the semiotics of stone imparting a message of strength and permanence for a young nation and the technological innovations developed at the Quincy quarries led to the country’s great era of building with stone beginning around 1830 and lasting approximately for a century. 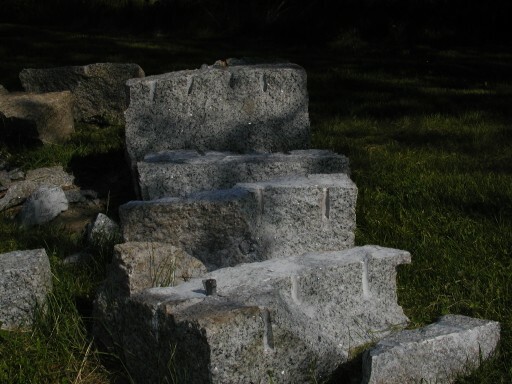 When that era began, the granite in Quincy was being used primarilty for public projects; those in the know were aware that the next great near-surface bedrock of granite existed on Cape Ann, and it was in Rockport where the age of commercial stonebuilding in America began. During the next hundred years many of the most significant stonebuilding projects in America were constructed of Cape Ann granite. The Longfellow Bridge in Cambridge, MA, Fort Independence in Boston, MA, The Holland Tunnel and Woolworth Building in NY, the base of the Statue of Liberty and steps of the Washington Capitol, the Carnegie-Mellon Bank in Pittsburgh, PA and Custom House in Boston, (the tallest non-reinforced stone structure in America at over 400′) are just a few examples of Cape Ann granite construction. Not to mention the decades it was transported on massive stone-carrying sloops for use as paving stones for parts of New York City … New Orleans … Havanna, Cuba … Seville, Spain and Paris, France, to again cite only a few examples, making stone quarrying the first great domestic and international industry in America. There’s another very significant reason why Cape Ann granite became America’s featured stonebuilding material for a century: it’s unique density of 160lbs. per cubic foot, making it among the toughest stone in the world ever used for building. That story, encompassing the unique geological history of Cape Ann, will be the subject of the next interpreter’s notes. If you want to know more about quarrying on Cape Ann, go to www.sandybayhistorical.org and www.capeannhistoricalmuseum.org or check out this excerpt from an 1884 edition of Harper’s Magazine. And if you want to know even more about this too infrequently related aspect of American history or would like to see some Cape Ann granite being split using widgets and half-rounds, just come to our Quarry Tour on Saturdays at 10:00am.